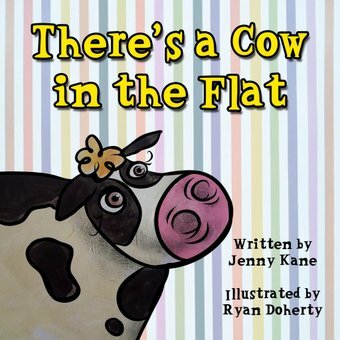 I am delighted to be able to announce that my very first children’s story, There’s a Cow in the Flat is out NOW!! I can’t tell you how excited I am about this. I wrote this story for my children when they were very small. It was then polished and developed during a handful of creative story telling sessions I taught at two different primary schools- Crombie Primary in Aberdeenshire and then- right down the other end of Britain- at Heathcoat Primary School in Devon. It’s been 6 years since I took There’s a Cow in the Flat (and all my other children’s stories), into a school, and I’m really looking forward to taking it back on the road again- but this time, with a copy of the published book in my hand, rather than just a handful of well remembered notes!!! I would like to extend a HUGE thank you to the wonderful illustrator Ryan Doherty for bringing my cow, Oscar, and his mum to life with his brilliantly bright pictures, and to Hush Puppy Books for letting me add another literary genre to my bow! I’ll be back to tell you more about Oscar’s adventure soon, but for now- here are those all important buy links! !